Spot the Dangers is an exciting new tool developed by the Canadian Coast Guard Auxiliary - Pacific to teach kids about the importance of boating and water safety. 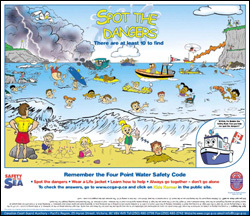 This colorful poster challenges kids to find at least 10 marine-related dangers in and around a busy beach scene, and features a four-point water safety code: spot the dangers, wear a lifejacket, learn how to help, and always go together - don´t go alone! The poster was originally designed by the Royal National Lifeboat Institution, a world leader in marine search & rescue and search & rescue prevention. Spot the Dangers posters will be distributed by CCGA-P members to the public at boating safety events throughout the year.